The Buff-Breasted Sandpiper was photographed at the Wind Lake Grass Farm in Union Grove, Wisconsin. 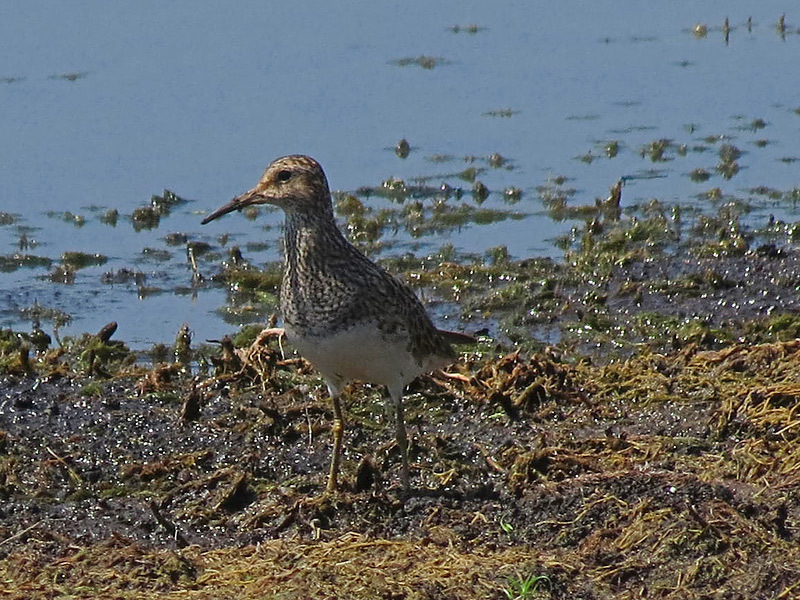 The Buff-Breasted Sandpiper is brown above and buff below with a short bill, light eye-ring, and yellowish legs. It has a breeding range of northwestern American Arctic. It has a habitat on mainly dry short grass prairies and tundra ridges. This is an odd setting for shorebirds. It feeds on mostly insects. 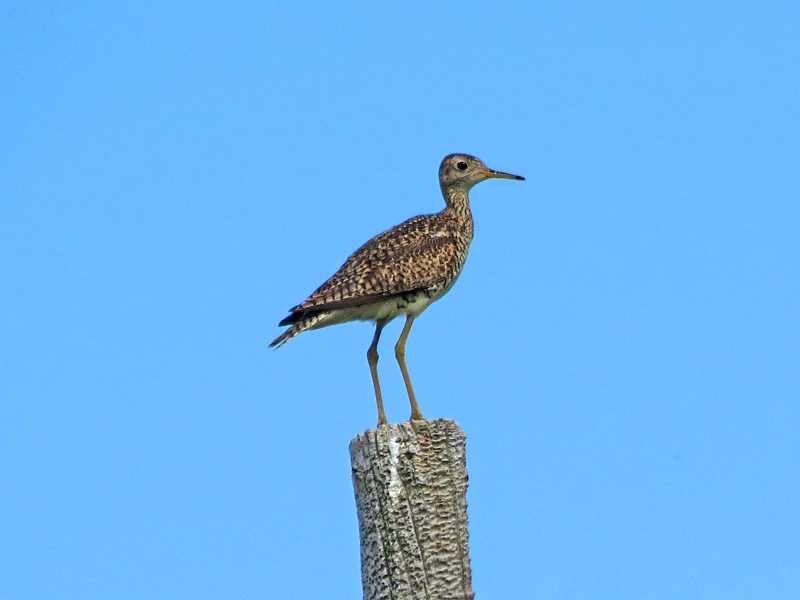 The Upland Sandpiper is a “pigeon-headed” brown sandpiper with a small head, short bill, thin neck, long tail, and shoe-button eye. It often perches on fence posts and poles and holds wings elevated. It has a range of mostly Canada and northern United States. It has a habitat of dry grassy prairies, open meadows, and fields. It is almost never seen on mud flats or other typical shorebird habitats. It has a diet of mostly insects and seeds. 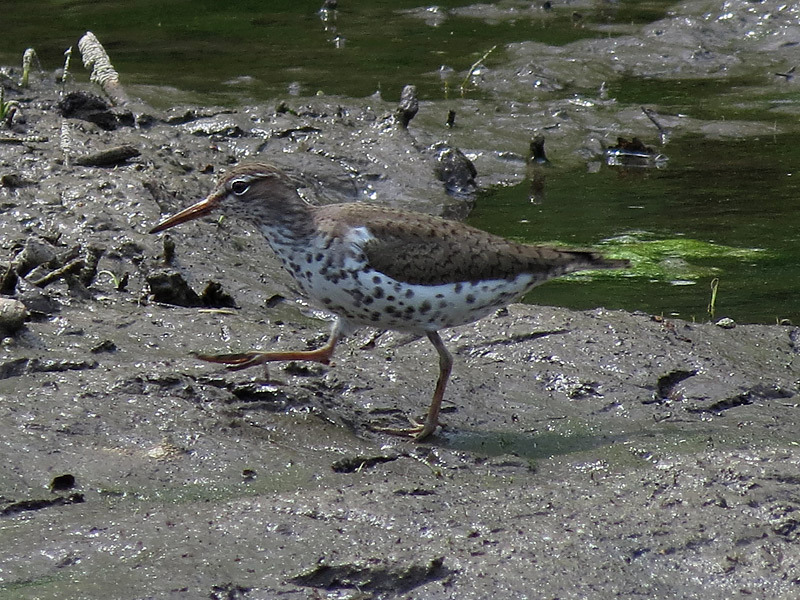 The Spotted Sandpiper was photographed at the Wehr Nature Center in Milwaukee, Wisconsin. During fall and winter, and when not breeding, the Spotted Sandpiper does not have spots on the breast. 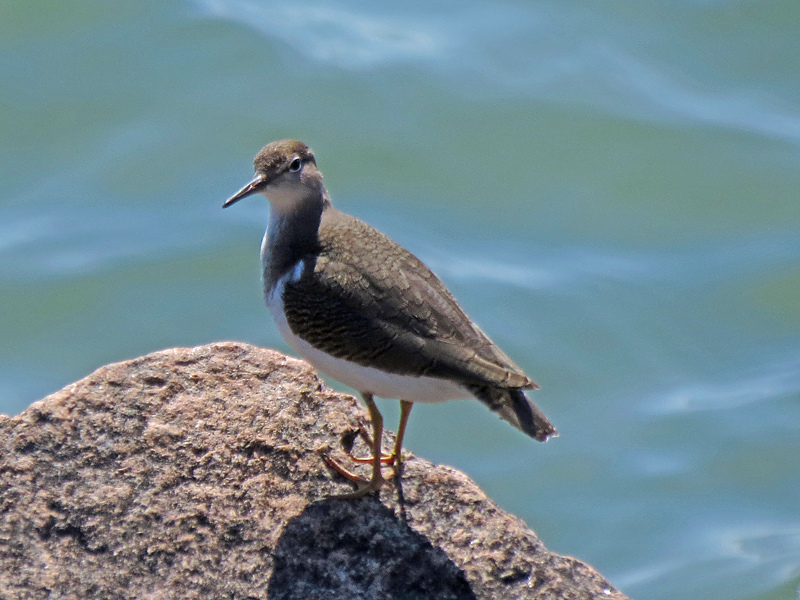 The Spotted Sandpiper is olive-brown above with a spotted white breast, a white line above the eye with a white ring, and a white wedge shape near the shoulder. It has pale fleshy legs. As it walks on shores of streams, ponds, and marshes, it bobs the rear half of its body up and down in an odd teetering motion. It has a range from Alaska, Canada, to the central United States, and along, and along the coasts. It has a diet of insects, crustaceans, small fish, and other invertebrates. 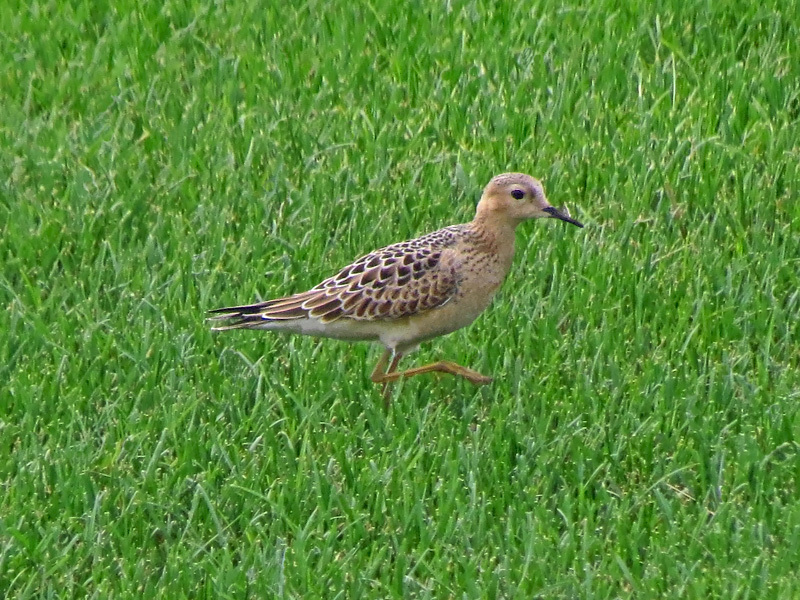 The Pectoral Sandpiper has a dark back lined in white with heavy breast streaks that end abruptly to white. The legs and bill are a dull yellowish green. Pectoral refers to an inflatable air sac on the male’s chest that can be puffed out. The range is the Siberian and American Artic and winters in South America. Its habitat is green grassy marshes, prairie pools, muddy shores, and fresh and tidal marshes. The diet is mostly insects. 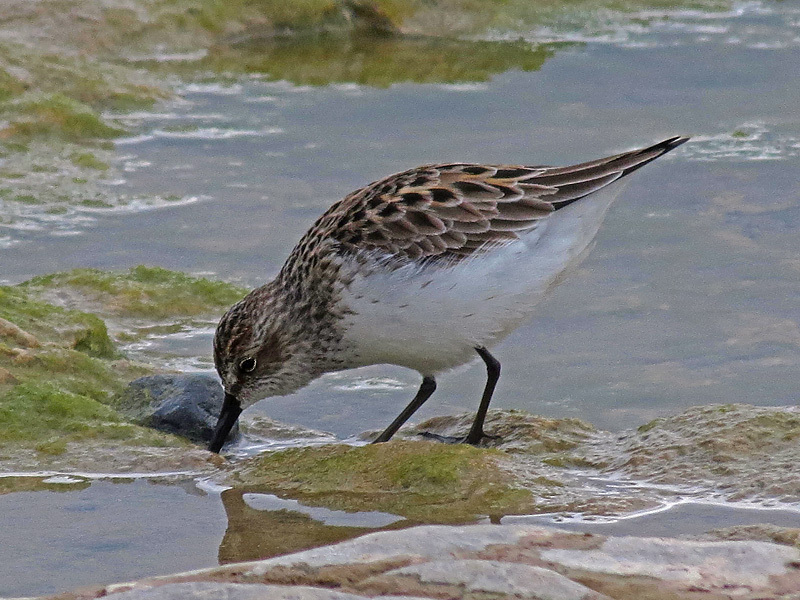 The Semipalmated Sandpiper was photographed at North Point on Lake Michigan in Sheboygan, Wisconsin. The Semipalmated Sandpiper is plain in appearance with gray above, a white belly, and a short black bill and black legs. It has a range and breeds in the North America Artic. It is known to make a nonstop 2000 mile flight from eastern Canada to the South American coast at migration. It has a habitat along beaches, mudflats, and tundra along lakes and the coast. The diet is mostly ting aquatic insects and crustaceans. The sparrow-sized Sandpipers are known as “peeps”. 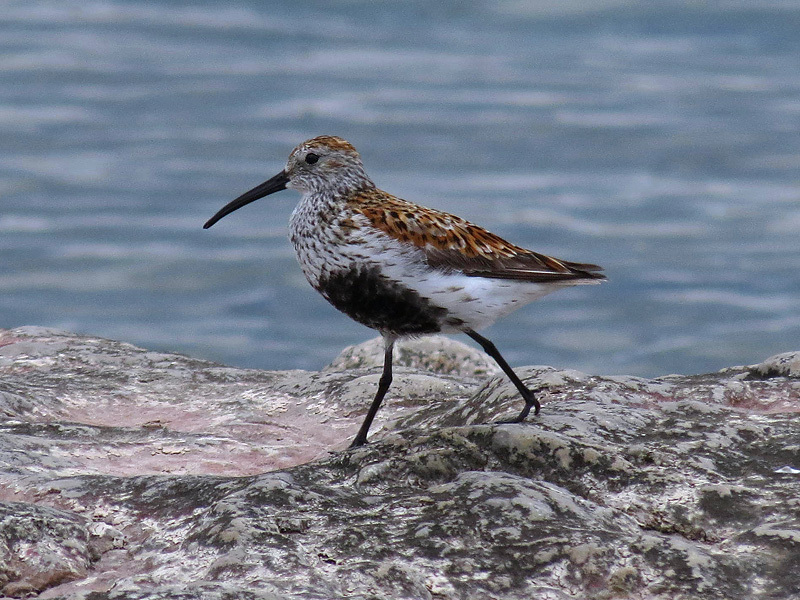 The Dunlin was photographed at North Point in Sheboygan, Wisconsin on Lake Michigan. The Dunlin is rusty red in the summer above with a black patch across the belly, and with a longish droop-tipped bill. In the winter is gray-brown on the top with a grayish wash across the breast. It is in the Sandpiper family. When feeding the bird’s posture is hunched. It has a range around the artic: circumpolar. In the winter it can be found around the coasts of the United States to Mexico. Its diet is mostly insects on the tundra, and other invertebrates on the coasts. It has a habitat of tidal flats, beaches, muddy pools, and wet tundra.